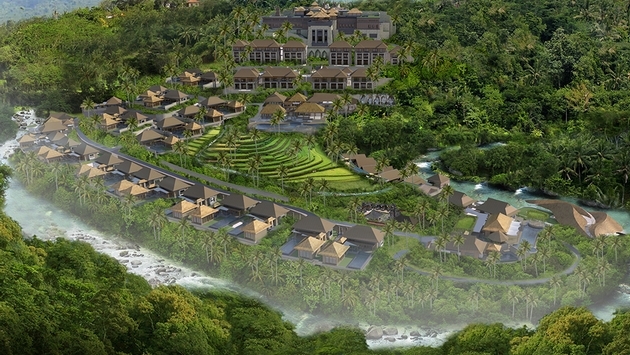 The Ritz-Carlton Hotel Company will open the company's third overall Ritz-Carlton Reserve in Bali, it was announced at the International Luxury Travel Market in Cannes. The property will be located in Ubud along the Ayung River (pictured above). It is scheduled to open in 2015 and will feature 60 villas and suites. The company’s other two Reserve properties are in Phulay Bay, Thailand, and Dorado Beach, Puerto Rico. The company also launched a Web site for the Reserve product. Ritz-Carlton also announced the launch of the Ritz-Carlton Kids program in conjunction with Jean Michel Cousteau’s Ocean Futures Society that centers on sustainability themes. Ed French, the company’s chief marketing officer, noted that the company’s business is evenly split between business and leisure travelers. “A sizeable portion of the leisure business comes from people traveling with families,” he said. Ritz-Carlton will open its 85th property with the debut of the 114-room Ritz-Carlton Herzliya outside Tel Aviv on Dec. 17. On a trade mission to China with British Prime Minister David Cameron, Richard Solomons, the CEO of the InterContinental Hotels Group (IHG), said that IHG plans to double its Chinese footprint in the next five years. “China is IHG’s second largest market after the United States and is likely to surpass the US to become our largest by number of rooms by 2025,” said Solomons. Right now IHG has 200 hotels open and 179 hotels in the pipeline in more than 70 cities in the country. In 2012, IHG launched HUALUXE Hotels & Resorts, a new brand targeting Chinese guests. The first HUALUXE Hotel will open in 2014, with 21 more on the drawing board and in various stages of development. IHG also opened the Hotel Indigo Düsseldorf - Victoriaplatz. The 126-room hotel is the third Hotel Indigo property in Germany, alongside Hotel Indigo Berlin – Alexanderplatz and Hotel Indigo Berlin – Ku’Damm. The W Verbier and The Residences at W Verbier became the first W Hotels in Switzerland. Located at the base of the mountain in the Medran area of Verbier, part of a multi-component luxury development project owned by Les Trois Rocs. W Verbier offers 123 rooms in four adjacent chalets on the Place Blanche. The hotel sits next to the main gondola offering immediate access to the resort’s ski slopes. The Residences at W Verbier, 15 W-branded, full-service residences, are located next to the hotel.